PRETEND for a moment you’re a race bike – no, don’t run away, I haven’t gone mad. I just want to try and explain to you how tough a season’s racing is. The chances are you own or have ridden a bike in the Supersport class. If so, you probably like to rag it a bit. People like 600s precisely because you get away with taking liberties. The racing is good, too. Not just because elbows are valid weapons, but because the bikes are so close to what you ride. While superbikes are essentially hand-built specials, Supersport machines are whipped off the production line, stripped of road-going junk, tuned and sent out. But while your road bike will last pretty well however much you abuse it, on the track it’s a different matter. A race machine is caned everywhere, all the time. Tickover is around 3000rpm so it’s still pulling when you shut off in corners, while bottom-end power means anything up to 10,000rpm. In one season, a bike may do a dozen races in the British series, plus one-off world championship rides, not to mention the Isle of Man TT and testing. That’s a brutal 1000 miles at race pace, and bikes need a thorough strip and rebuild before they’re ready for the track again. So when we decided to give the best of this year’s Supersport tackle a final – and very thorough – going over, you could almost hear the mechanical groans coming from the engines. Someone who definitely wasn’t groaning was Kawasaki British superbike rider Steve Plater, who we drafted in to test the machines. He might be doing the business in superbikes now, but he made his name in Supersport and, like you, he enjoys the smaller bikes because of the things he can get away with on them. The top finishers from Ducati, Honda, Kawasaki, Suzuki and Yamaha are ours for a day at Cadwell Park, the sun is shining (for the time being) and Plater has his leathers on. But before he goes near a bike, he offers to drive me around the club circuit to show me the right lines. I think I know where the track goes as I’ve seen quite a few races here and I’ve ridden it before. Once. In what I suddenly realise is the distant past. Plater lives a few miles from the Lincolnshire circuit and teaches at the Ducati Experience track school here, so he knows where he’s going. As we follow the track round, he gives me some useful advice: " People make the mistake of looking where they are. As soon as you’ve spotted where you’re heading, you should be looking for the next point. When you’ve seen your peel-in point you should be looking for the apex, and when you’ve seen that you should be looking for the exit. On some corners you’ll be looking straight ahead to the next corner entry. " But that’s enough learning for the time being. Now it’s time for Plater to take to two wheels and give us his opinion on the array of machines we’ve assembled for him. He’s keen to take out the Honda CBR600, as that’s the bike he raced in the past. Even at its jelly-mound ugliest, the CBR has always done the business. Now it looks a lot better, is just as popular and remains a competent package. It has enjoyed renewed track success this season and next year’s revamp looks set to build on that. The history of the CBR reflects the changing face of middleweight bikes. When it started out, they were budget machines with steel frames – serious sports bike buyers went for 750s. Now they’ve become more desirable, while the 750 class is a shadow of its former self. And whereas Honda always sold shed-loads of CBR600s on the all-rounder image, an out-and-out racer like the Yamaha R6 now outsells it. But Honda has never been shy of racing the CBR. You’d expect the bike to be compromised by the fact that it is based on an all-rounder, but Plater thinks otherwise. He says: " The standard bike is a good starting point. It’s very neutral and you can just get on with it. But it’s also a good bike to start improving on.
" The race bike holds a really good line in corners and tips into them quicker than the Yamaha. On this bike the bars are too high for me, but that’s probably because this is Kirk McCarthy’s bike and he’s a short-arse! I think the front end is better overall. " That’s good news for owners. Supersport rules mean you have to keep standard forks, but can change internals, which is a cheap and easy upgrade. Plater agrees: " There’s enough performance from the standard versions of all these bikes for most riders. If they want to start racing or just do a lot of track days, what they’d get the most from is sorting the suspension. Have the forks revalved and you’ll feel more benefit than getting a few more horsepower from the engine. " But the front end of McCarthy’s bike is still too hard for his liking. He says: " It just depends how you like to ride, though you also have to consider how the bike needs to be ridden. The race bike is stronger than stock all through the rev range. It isn’t as strong out of corners as the V&M Yamaha, but because it turns in quicker you can carry more corner speed and get out faster. You need the suspension set up to let you make the most of it. The front end was too stiff for me, but to improve a road bike you should head this way. " After riding the Honda, Plater is keen to swing his leg over the Suzuki GSX-R600. Afterwards, his first comment says it all: " Now I can see why I was runner-up to John Crawford twice! " Plater describes the GSX-R as " user-friendly " . And that’s vital for any race bike. It’s no good having twice the power of your rivals if you can’t use it. Better to have less, but use all of it – and Plater certainly feels like he can use it all. This bike was ridden by Jamie Morley and Gus Scott this year, Scott getting on board when Morley switched his focus to the Superstock 750cc version. But last year it took Crawford to the title that Plater was after. Plater says: " I spent two years looking at how well this thing seemed to turn. Now I’ve ridden it I can see why. The chassis is really good. You can go in deeper and brake later, because you can turn later on this. But even though you’ve left it late you can still hold a tighter line.
" The engine is very strong from 11,000rpm, but runs out of revs too early and the top end is quite weak. I’m sure the new bike will cover that. The suspension is good as well and the brakes are great. I could brake the latest on this. There’s good feel from the front end so you know what’s going on. " Careful, Steve, you sound like a Suzuki spokesman. Any bad points? " It’s nowhere near as fast as the V&M Yamaha and it is very different to the standard road bike. Chassis-wise this is quite a bit better than the road bike. It’s more stable – road bikes seem to shake their heads a bit, probably because the suspension is softer at the back end. The engine is also a lot stronger low-down, but most people wouldn’t need it. " There’s a long pause while Plater contemplates how to phrase his verdict on the bike. Clearly he likes it, but he doesn’t want to upset the men at Kawasaki. Finally he says: " If you wanted to do a lot of track days, the Suzuki is probably ideal. There’s a new model coming out so the value of secondhand ones will fall. I’ve had a flick through Bikemart and you can get a recent one cheap. Put a race fairing on it, do some simple suspension work and have fun! It wouldn’t be the fastest thing out there, but you don’t need that on a track day. Enjoy the chassis and make the most of what you’ve got. " Next up is the Ducati 748RS. Plater has a huge amount of experience on the stock bike as an instructor at the Ducati Experience. It’s one of the most desirable road bikes around – some people prefer it to the 996, though visually they are almost identical. Plater says: " It’s a brilliant bike. You can get one of these out of the crate, put it on the track and ride fast straight away. They’re really easy to get on with. " A rule change allowing V-twins to take part in the series was only brought in last season. 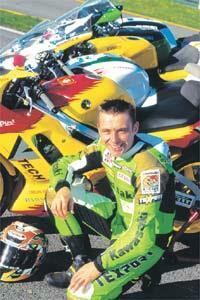 That means Plater has never raced against a Ducati 748 and he’s looking forward to riding it. But he comes back disappointed. He says: " I can’t believe how different it is to stock. You’ve got to work really hard to make it do what you want. The front end was really unstable and I had to get right forward on the tank to keep some weight on it. The engine is fast, but you’ve got to work it. There’s no bottom end, which surprised me because the stock bike has pretty good power as soon as you roll the throttle. " You’d expect a great road bike to be a fantastic racer, but it isn’t that simple. It’s not a criticism of the Ducati. All the bikes here were set up for the men who’ve been riding them all year. Like a tailored Italian suit, the Ducati is the most individual bike in the series. It offers a range of adjustability that simply isn’t available on the other bikes. For example, you can alter the geometry by playing with steering head angles and trail. Clearly, Dean Thomas’s set-up didn’t suit Plater. He says: " I reckon most road riders would be best off just leaving their bikes standard. This isn’t a bike to play about with unless you really know what you’re doing. You could fiddle with the set-up, get it tuned and just go backwards. Leave it alone and just learn how to make the best of it, then you’ve got a great track day package. " Plater also criticises the bike’s braking. He had to brake earlier and harder on the race bike – but that could be due to worn pads. So the lesson for road riders is that with the 748 you’ve really got a race-developed bike. It gives you the chance to make the bike suit you, but also offers the opportunity to mess it all up. Unlike this year’s championship winner, the V&M Yamaha R6, which didn’t need much messing around with. We managed to wring 180.9mph out of this very bike at Bruntingthorpe just two days before we brought it here, and Plater’s overwhelming impression is one of speed.
" It’s so fast – it revs for England! There’s power all the way to the top end at 15,000rpm. The rear suspension is too soft for me, but it probably suits Jim Moodie’s style perfectly. It didn’t quite hold the line, but I’m impressed with the overall package – though it took me a while to get used to the quickshifter. " Quickshifters as such aren’t allowed in the Supersport class and the bike doesn’t have one. What it has is an ignition interrupter, which means you can hold the throttle open and change gear. Plater adds: " The front end feels vague, but that’s probably because of the rear end problem. The suspension works very well and I didn’t adjust anything. I backed the steering damper right off as I don’t like them myself and the bike seemed very stable without it. The bars were too narrow for me, but overall it was nice and smooth and an easy ride. " So how does it compare to the road bike? Plater says: " The big difference is the power. It’s much stronger than standard. In terms of handling it isn’t all that different to the road bike, but this is under-sprung for me. Moodie is a smoother rider than me so it’ll work for him. A road rider would probably be overwhelmed by the rush of power everywhere. Just sort the suspension and get on a track – it’s fast enough for most people already. " The Kawasaki ZX-6R is Plater’s final ride. This bike has had a few problems recently, to say the least. Gary Mason burst the engine on his race bike, and to get it running again for his wild-card ride at the final World Supersport round at Brands Hatch, tuner Nick Morgan had to beg and borrow a few engine bits – like a complete bottom end, which he swiped out of a mate’s standard road bike! The rear shock isn’t the usual one, either. It has a WP unit normally used on a ZX-9R, rather than the more usual Ohlins, and it isn’t quite right for Plater. He does a couple of laps then asks for it to be changed. He has a better time the second time around, though the suspension set-up still isn’t quite to his taste. It’s no surprise to learn that Plater has done a few miles on the stock bike and knows it pretty well. When he comes back, we’re worried he will just shower the bike with praise – he’s a Kawasaki employee, after all. But his comments seem mercifully free of PR speak. He says: " This feels the closest to the road bike. Obviously the power is up and the handling is improved, but there are no areas that are massively different. The rear was way too soft for me, but maybe I’m heavier than Gary. It’s making the bike run wide, but I’m not trying to race any of these bikes so this isn’t a problem.
" The bike turns well and tips into corners really nicely. The front end is good and I think the rear would be fine with a stronger rear spring. It’s just like the road bike, but with more of everything, everywhere.
" The engine is really good from the bottom. With such a strong bottom end you don’t expect it to keep going, but this revs really well and still pulls well at the top. " Biased? No, because I took the precaution of riding the bike, too. When Plater talks about bottom end he’s referring to what we think of as mid-range – he seriously suggests 11,000rpm is " low-down power " . As far as I’m concerned, bottom end is from tickover, and the bike pulls cleanly and smoothly. You’d quickly feel at home here if you were used to the standard machine. And that’s what you want. We didn’t bring the bikes to Cadwell to pick a winner – that’s already been done over 12 races in the British championship. What we wanted was to get an idea of how the race bikes compare to the road-going versions. Plater had ridden all the road bikes. Now he has ridden all the race bikes and he can see where they differ. There aren’t any duff bikes, as you’d guess, but there is something to suit everyone. If you know what you’re doing and are prepared to spend a lot of time getting it just right, the Ducati 748R will agree with you. But tweak it at your peril. If it’s uncomplicated fun you’re after, get a cheap, secondhand GSX-R600, book a season of track days and just let rip. The Kawasaki ZX-6R looks like the all-rounder – but get a race fairing, keep the road bodywork in your garage and that’s all you’ll have to change when you switch between track and road. The same goes for Honda’s CBR600 – in fact, brand allegiance is the deciding factor with these four bikes. But if it’s sheer speed you’re after, get the Yamaha. Tuned or untuned, it’s fast. V&M has shown it can stand plenty of extra ponies, so speed freaks can build a bit of a sleeper by getting a good tuner to poke around inside the engine. Then take it to a track day and embarrass the litre boys. IT has been racing as long as it has been around, but in recent years it has lost out to newer, more race-oriented bikes. This year’s CBR was a stronger performer and took second in the series. Next year should be even better, with the revised Sport version designed to be more tuner-friendly. THE new kid on the block. Until new rules were introduced last year the 748cc twin didn’t qualify for supersport. Like its 996cc big brother, the 748 is built to race and offers more adjustments than most of its rivals. With Dean Thomas on board it had a pretty successful first year in Britain, taking third overall. THIS was top Suzuki in the British series. Oh, and bottom. And all places in between – it was the only one. It won the title two years running (with considerable help from John Crawford), but has now turned almost invisible. It’s a dated bike, but the all-new 2001 model should be a huge improvement. THE R6 has been one of the dominant bikes of the year, taking the World and British Supersport titles as well as victories at the Isle of Man TT and the North-West 200. It’s blisteringly fast, as last week’s 180.9mph set in an MCN test proves. It’s the most race-focused bike here and is uncompromising on the road. Consistently one of the fastest 600s. Kawasaki has not been prepared to compromise the bike’s road-going comfort by turning it into an out-and-out racer, but with an engine this strong, there’s lots of performance on tap. Gary Mason took his bike to eighth overall this year. IT’S the datalogging kit strapped to the pillion seat that gives the game away. This is no F4 1+1.